Vivaldi Technologies AS, the company behind the Vivaldi web browser, released a first build of the browser for Raspberry Pi and other ARM-based Linux devices today. Vivaldi browser is currently available for the desktop operating systems Windows, Linux and Mac OS X. The new version, called Vivaldi for Linux ARM, adds ARM-based Linux devices such as the Raspberry PI 3 to the list of supported devices. Vivaldi Technologies mentions the following devices explicitly: Raspberry Pi Zero, Raspberry Pi 2 and Raspberry Pi 3, CubieBoard and ASUS Tinker Board. It should run on most of these devices however. Users who run Linux ARM devices have a selection of web browsers at their disposal that they can choose one from already. There is Chromium and Firefox ESR for instance, but also lesser known browsers such as Epiphany or Midori. Vivaldi for ARM offers the same functionality as the desktop client. It needs to be noted that it is released as a preview build right now, and users should handle it like any other beta release. Download and installation of Vivaldi is straightforward. Users need to download the version of the browser from the official website, and double-click on the downloaded file afterwards to run the installer. The release is offered as a .deb file. The company runs a small giveaway on its site. 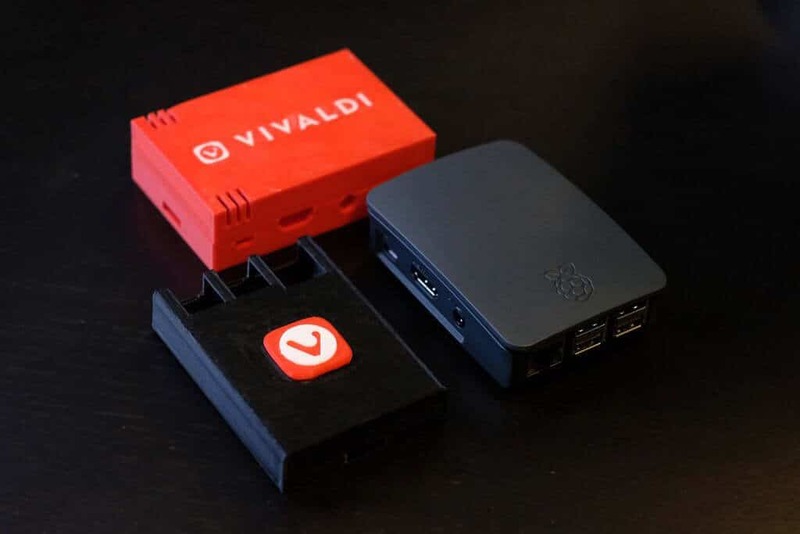 You can win one of five Raspberry Pi Model 3 devices with a custom Vivaldi case, power supply with international adapters, a 16 GB Micro-SD card, and some Vivaldi swag. You need to share your plans for a Pi project in the comment section on the site to enter the giveaway. Vivaldi offers features that make it an interesting choice for low-powered devices. It supports disabling the loading of images or animation for instance, lazy loads tabs from previous sessions, and comes with a reader mode to load an optimized version of a page that does away with most third-party content. Vivaldi Technologies is working on bringing the web browser to mobile devices as well. While there is no ETA for the first builds for Google's Android and Apple's iOS operating system, support will come eventually for these operating systems. Now You: Do you use ARM based Linux devices? Totally non-snarky observation/question – I am legitimately curious how Vivaldi will perform on these devices considering the relative performance struggles it has at times on much more powerful hardware. Vivaldi has a lot of interesting ideas wrapped up in the browser, but I would never think of it as a good choice for low-end or older desktop/laptop hardware, much less devices like the Pi. I was thinking the same, would hate to think how it runs on the zero. Why does it have to perform better than Firefox on Pi? There are plenty of reasons to dislike the new Firefox, don’t get me wrong, but outside of Vivaldi having the advantage of building this specifically for the Pi and similar devices, I don’t see why Vivaldi would just naturally run better than Firefox. Especially when for all the acclaim Vivaldi has rightfully earned for adding numerous features baked into their browser, performance has never, ever, been one of the things users have touted as an advantage for the browser over Firefox or it’s Chromium-based cousins. I’m encouraged by this and the release of other apps (applets?) for the ARM platform. Yes, there are performance limitations with these smaller devices, but perhaps this might encourage somewhat tighter code and less feature bloat. For those of us who choose not to deal with the inherent visual limitations of smart phones for viewing web pages and photos, an ARM tablet project running a minimal NIX flavor with capable desktop tools fills this niche.